Thanks to the support of the Earthroots community, I was one of 7 participants who traveled to the Kalahari Desert of Botswana this Spring on a cultural exchange and tracking trip led by Jon Young & Nicole Apelian. 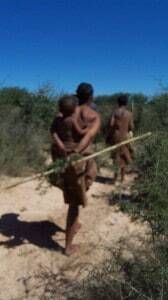 Although Jon & Nicole organized the trip and are internationally recognized trackers & mentors, our main guides in the Kalahari were, of course, the Bushmen. 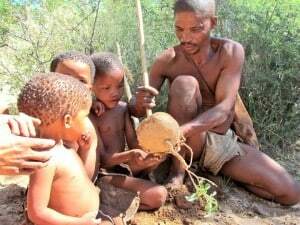 The Naro Bushmen we learned from have lived in in the Kalahari Desert all of their lives. They greeted us barefoot, wearing simple animals skins with smiles and presence. Their relatives and ancestors have lived there for over 20,000 years, gathering, hunting and living in community with what is growing naturally in their area. 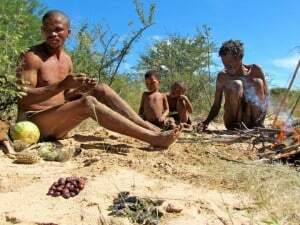 The depth of connection that the Bushmen have to everything they come into contact with in their desert home – is indescribable and makes me long for the same. Coming to a water hole, we found and harvested mild onion-like plants growing in the water. Men, women, children & elders working together offered a new perspective on education and the importance of community. Every moment with the Bushmen was a gift, teaching me what it is to thrive in a place where your needs can be found within walking distance, and community is truly there to support each other for the well being of the whole. They are aware of every bird sound, every animal track in the sand, every edible, medicinal, poisonous plant and venemous snake we walked past. They encourage each other to share what they know and take turns talking. They teach their children how to live with the resources around them, by living as an example. They honor the elders and care for the earth. We walked through head-high brush & trees, knee high grasses & endless sand. Many plants had thorns that would hook our sleeves as we walked by. The sand was soft on bare feet and the weather was much like springtime in Southern California. Warm days, cool nights, sometimes rain. As we walked through the desert, we would harvest roots, seeds & nuts. We did not follow trails or signposts of where to go. We followed paths between the thick brush created by Kudu, Gemsbok, Springbok and Wildebeests. Game trails made accessible pathways for us to follow. When the time was right, and we found a clearing in the shade of larger bushes and trees, we would sit down and get ready to eat. We were not carrying pots or matches. Instead, Xigao would take out the hand drill he carried in his leather pouch and take turns with Guma rubbing the spindle on the fire board to create a coal to start the fire. Ganuma is an elder. He lost many teeth and has a hard time chewing food. His body is thin and he has big scars healed long ago that tell stories of when he was speared by a Gembsok on a hunt, his healing journey and the strength to survive. He holds the fire board with his fingers while the stronger men roll their palms & fingers with force on the round wood to build heat with friction and make a coal to start the fire. While the men started the fire, the women gathered sticks from the bushes nearby for the fire and grass to make serving plates all while tending to the children. These “plates” are nothing more than bundles of long dry grass which protect the cooked food from the sand. Imagine every day eating food with sand. It would wear down your teeth pretty quickly. The grass “plates” were really helpful. As the fire & cooking got going, we would gather around, share stories with the help of our translator, Neeltjie Bower, and share food with our new friends. Some of the foods shown in this photo were roasted directly on the coals: Jewel Beetles (crunchy, delicious & salty), Coffee Beans (not at all like coffee that we know, but more of a dense sunflower seed texture), Gemsbok meat in strips & round nuts that looked like macadamia nuts. The roasted beetles were passed around in a turtle shell bowl. Everything has a purpose. We ate some of the foods fresh & uncooked, including melon (yellow on the inside and less sweet than what we are use to with watermelon) and spiky cucumber (tasted just like a cucumber from home, once you got the spikes off). I enjoyed all of it, especially the Gemsbok meat & nuts. I felt adventurous eating the beetle and surprised myself when I liked it! During the meal, topics of conversation ranged from what we were eating to how they store & carry water, how they hunt, what life cycle rituals are practiced, stories of healing injuries, educating the children & how they have experienced modern influences to their culture. There was never a dull moment. This was a life-changing experience and there are many stories to tell. I will be sharing more photos & stories on this blog throughout the year and will be presenting on my travels Fall 2011. Check back for updates. 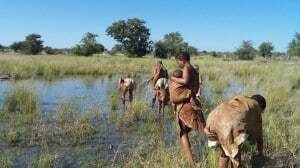 This entry was posted in Cooking, Kalahari, permaculture, Primitive Skills and tagged Bushmen, Edibles, Kalahari, Nature, Wild. Bookmark the permalink.